Dr. Dean Dornic, MD has had an interest in eye care since 1980. His background is quite unique in that he has both a doctor of medicine and doctor of optometry degree. Dr. Dornic's experience as both an optometrist and ophthalmologist gives him a balanced perspective on surgical and non-surgical treatment of ocular disorders as well as insite into the optometric and medical professions. 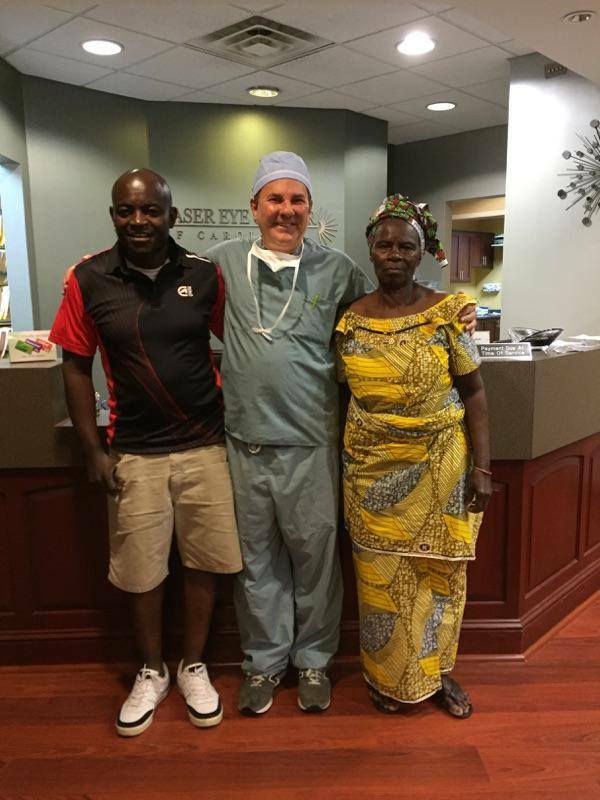 People come from around the globe for Dr. Dornic's expertise. If you are traveling a long distance and need help with overnight accomodations, just call the office at 919-467-9955 and we will be happy to assist! 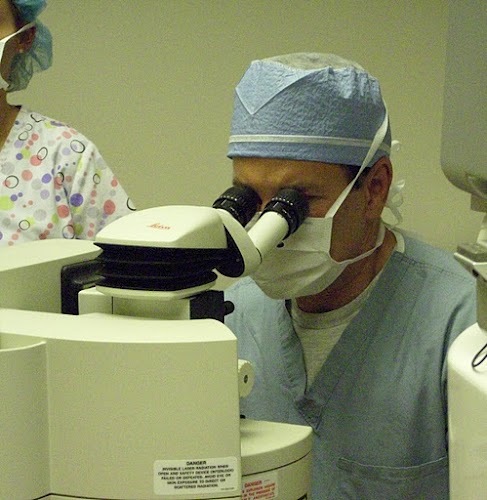 Dean Dornic is one of the Carolinas’ most experienced and qualified refractive surgeons, having performed thousands of successful LASIK surgery procedures at his Cary practice and at area clinics and hospitals! He is a board-certified, fellowship-trained, vision correction specialist dedicated to the highest standards in ophthalmic surgery. Dean Dornic is the first Raleigh / Durham-area ophthalmologist to perform IntraLase®, a revolutionary advance in LASIK that utilizes a laser rather than a metal blade to make the LASIK flap. Dr. Dornic also uses his IntraLase experience to perform Intacs in a blade-free technique. He is the first area ophthalmologist to provide Intacs®, LTK, and the implantable contact lens. His extensive experience in a variety of vision correction procedures means that he can offer the procedure most likely to satisfy your visual needs. Dr. Dornic is an active member of the medical staff at Rex Health Care Center, WakeMed Cary Hospital and Johnston Memorial Hospital. After completing his ophthalmology training at University Hospitals in Cleveland, Ohio, he underwent additional fellowship training in refractive surgery at the prestigious Sinskey Eye Institute in Santa Monica, California. 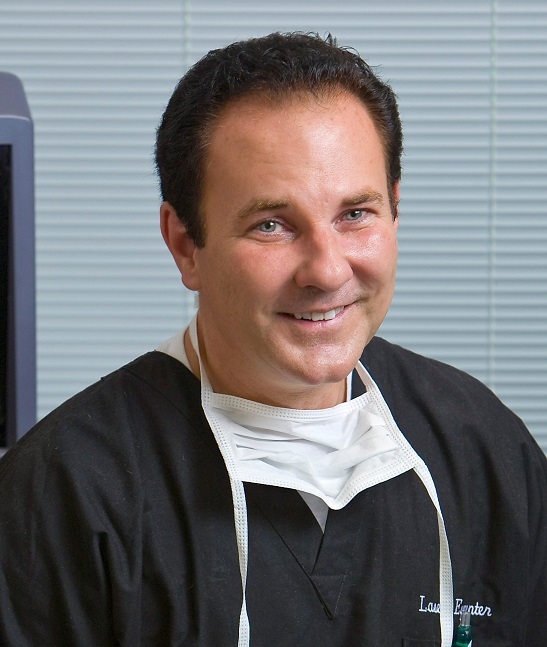 Dr. Dornic brought his expertise in refractive surgery to North Carolina in 1998, and has been practicing here ever since. 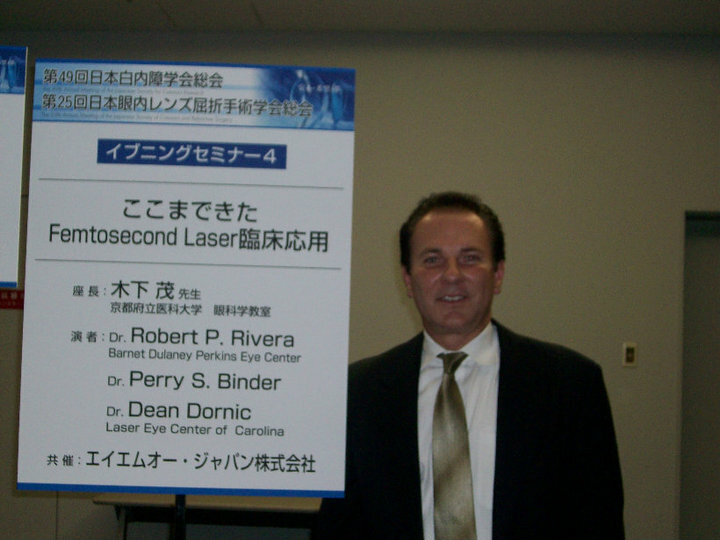 In addition to having a thriving LASIK eye surgery practice in Cary, Dean Dornic is a recognized authority in vision correction procedures, having lectured at international meetings and publishing a book and various papers on ophthalmological topics. Dr. Dornic has been recognized by his peers as a leader in his profession. He is a reviewer for 2 leading ophthalmology journals: The Journal of Refractive Surgery and Graefe's Clinical and Experimental Ophthalmology. He has been selected by his peers for inclusion in the prestigous "Castle-Connolly Top Doctors" award: a recognition awarded to the top 1% of physicians. In addition to standard LASIK surgery at his Cary practice, Dr. Dornic performs wave front-guided LASIK, LASEK, PRK, LTK, Intacs®, CK®, AK, refractive lens exchange and implantable contact lenses. He would be pleased to meet with you and personalize a treatment that is right for your vision needs. To enjoy outstanding LASIK and other procedures from Dr. Dean Dornic, contact our laser vision correction center in Cary today. 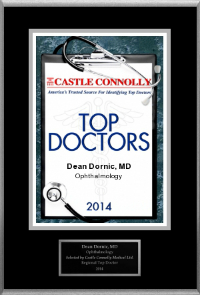 Just notified: Dr. Dornic named one of America's Top Ophthalmologist . 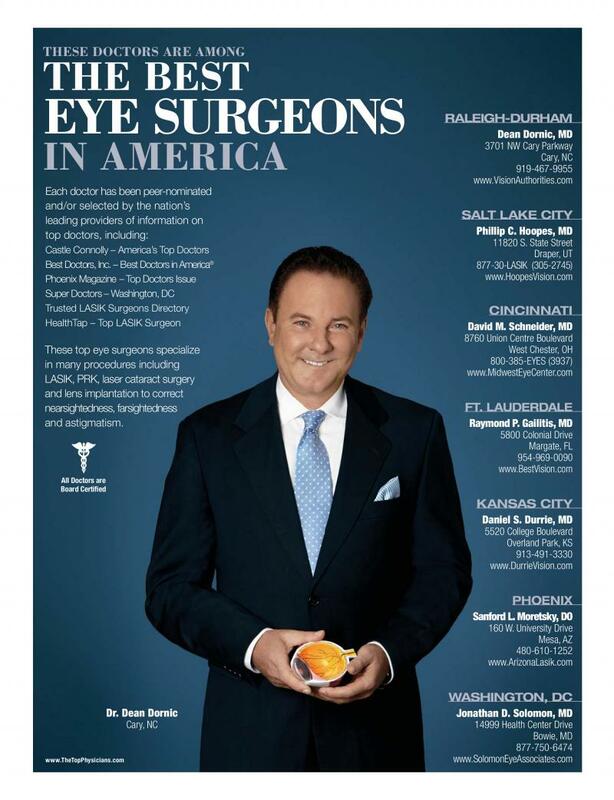 Dr. Dean Dornic selected as a Top 50 LASIK surgeon by Sightpath Medical. Dr. Dornic selected by the Better Vision Network to be their exclusive LASIK provider in the Raleigh, Triangle region of North Carolina. There is an abundance of useful resources available on the net. For information on refractive surgery, visit the Laser Eye Center of Carolina web site at www.visionauthorities.com Our practice websitewww.eyespecialistsofcarolina.com offers more information on cataract surgery and general eye information. Also, consider visiting the website of reputable professional eye organizations including the American Academy of Ophthalmology, theAmerican Society of Cataract and Refractive Surgeons and the Council for Refractive Surgery Quality Assurance. 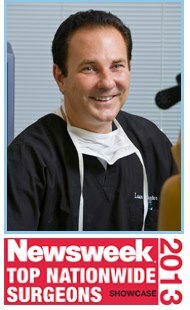 AskLASIKDocs.com is a site where you can post a question about refractive surgery to a panel of respected LASIK surgeons. Of course,feel free tocontact us anytime! We look forward to hearing from you. Every patient who chooses Laser Eye Center of Carolina for his or her vision correction procedure gets the "VIP" treatment. 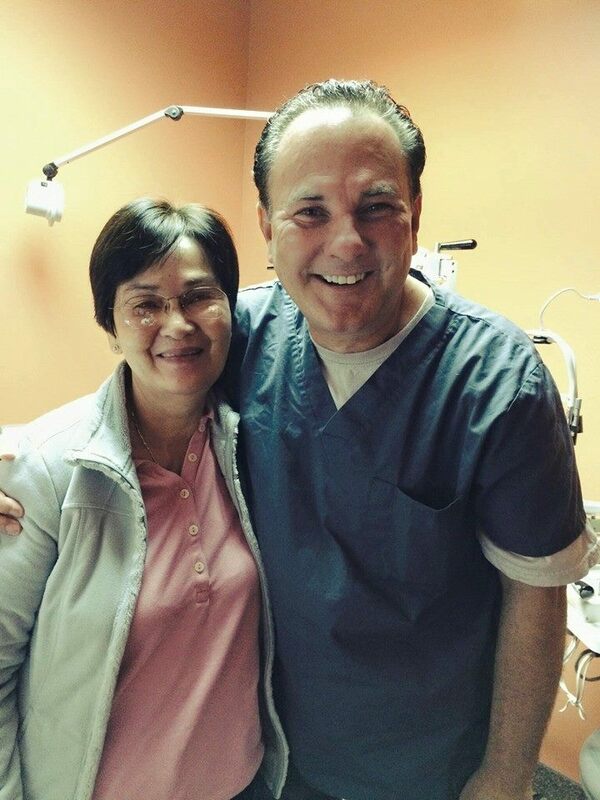 Dr. Dean Dornic and his staff do everything possible to ensure the success and safety of their treatment. At Laser Eye Center of Carolina, we believe that LASIK surgery for our Raleigh / Durham patients requires aseptic (sterile) conditions. Did you know that some eye surgeons still perform their procedures in street clothes and bare hands? Why not insist that risks be minimized? To ensure only the safest LASIK surgery for our Raleigh / Durham patients, each receives both preoperative and postoperative antibiotic eye drops. In addition, every member of the surgical team wears scrubs, surgical masks, caps, and gloves. Whenever possible, disposable, rather than reusable, supplies are used. In addition, we are one of the few centers in the region to utilize the Cox dry heat sterilizer, which is felt to significantly reduce the risk of infection and inflammation. Traditional cataract surgery is one of the most frequently performed surgeries and also one of the most safe and effective, with predictable outcomes. In traditional cataract surgery, most of the steps of the procedure are done manually.﻿Recently lasers have been introduced to automate parts of the procedure. 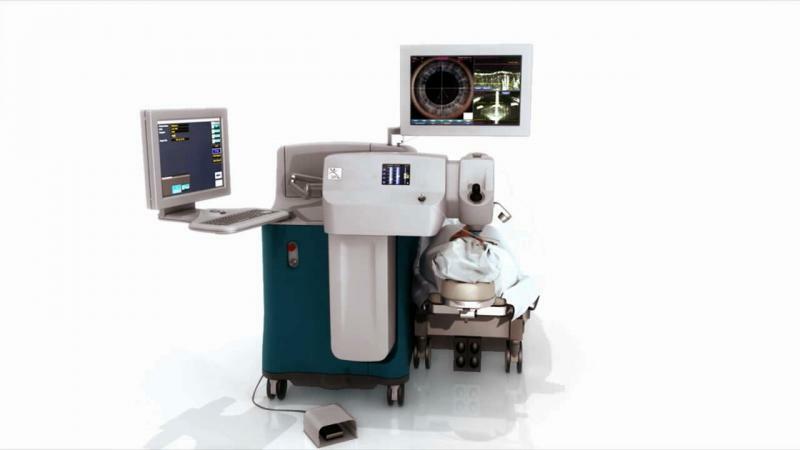 Laser cataract surgery procedures are generally more predictable and precise.﻿ Dr. Dornic is pleased to offer Laser Cataract Surgery for his patients who desire this technology. Come in for a consultation to find out more. A recent survey of members of the American Society of Cataract and Refractive Surgeons highlights the challenge of cataract surgery in patients taking tamsulin (Flomax). Many surgeons have expressed frustration over the apparent lack of awareness about IFIS on the part of prescribing physicians. A number of ophthalmologists have suggested that an eye exam should be performed in patients with cataracts who are about to be started on an alpha blocker, and this suggestion has been debated by the ASCRS Cataract Clinical Committee. In March 2008, a link to an anonymous online survey was emailed to the global ASCRS membership. When asked whether IFIS was more likely with tamsulosin versus a non-specific alpha blocker 90% of those who felt they had enough experience to comment indicated that IFIS was more likely with tamsulosin and approximately 2∕3 said that it was “much more likely”. The overwhelming majority (95%) of respondents finds that tamsulosin increases the difficulty of cataract surgery, with approximately 3∕4 believing that it increases the risk of complications compared to non-IFIS cases. The most common complication was significant iris damage, with 52% of respondents reporting this occurring at a higher rate than in non-IFIS eyes. Posterior capsule rupture in IFIS eyes was reported by 1∕4 respondents, with 23% overall reporting this complication occurring at a higher rate than in non-IFIS eyes. Thirty percent of respondents reported no complications in IFIS eyes during the preceding 2 years. Prior surveys have compiled cataract complication rates associated with IFIS that had occurred prior to the original description of IFIS and its association with tamsulosin. This is now the largest survey of complication rates covering a more recent period during which cataract surgeons would have been able to recognize, anticipate, and manage IFIS with a variety of recommended strategies. That IFIS apparently still increases the rate of cataract complications is important new information. Only about 1∕3 surgeons ever stop tamsulosin prior to cataract surgery. In declining order of frequency, strategies most often used on a routine basis are intracameral alpha agonists (38%), iris retractors (33%), preoperative atropine (19%), Healon 5 viscoadaptive OVD (15%, Advanced Medical Optics, AMO, Santa Ana, Calif.), and pupil expansion rings (4%). However, if those who have never tried a particular strategy are excluded, the following percentages of respondents were not satisfied with these same strategies: intracameral alpha agonists (26%), iris retractors (17%), Healon 5 viscoadaptive OVD (33%), and pupil expansion rings (60%). For the question, “what is your most favored initial strategy for managing IFIS?” there is no clear single preference, with 1∕3 surgeons routinely employing more than one strategy. Self reported complications with intracameral alpha agonists, such as epinephrine or phenylephrine, were rare, with less than 1% reporting instances of either TASS or systemic hypertensive spikes. Twenty one percent of respondents felt that prescribing doctors should routinely refer all patients to an ophthalmologist prior to starting tamsulosin. Another 38% felt that only patients with cataracts or decreased vision should be referred. The remaining 41% felt that a pre-treatment examination was not necessary. For non-specific alpha blockers, the corresponding percentages were 11%, 31%, and 58% respectively. Another question asked whether the respondent would take tamsulosin if he or she had BPH and a mildly symptomatic cataract. Nearly 2∕3 would not, either electing to have cataract surgery first (24%), taking a non-selective alpha blocker instead (17%), or avoiding alpha blockers entirely (23%). Finally, there was a strong consensus that prescribing doctors (urology, family practice, internal medicine) should become better educated about IFIS. Ninety one percent agree with this statement (54% strongly agree) compared with 3% who would disagree. On the basis of this survey, the ASCRS Cataract Clinical Committee is launching a national campaign in conjunction with the American Academy of Ophthalmology aimed at better educating prescribing doctors, pharmacists, and optometrists and ophthalmologists about IFIS. In addition to sharing the results of this survey, this educational effort will offer the suggestion of involving the patient’s cataract surgeon before initiating chronic tamsulosin or alpha blocker treatment in someone with a known history of cataract. • All six preoperative and surgical strategies mentioned are commonly used, but there is no clear preference for a single strategy. Many surgeons routinely combine multiple strategies. • Despite the ability to anticipate IFIS and to employ multiple operative strategies, the cataract surgical complication rate is still higher than in non-IFIS eyes. The most common complications are significant iris trauma and posterior capsular rupture. • Because of the increased difficulty and risk of complications during cataract surgery, nearly 2∕3 ophthalmologists would not take tamsulosin if they had a mildly symptomatic cataract. Of this group, some would take a non-specific alpha blocker but not tamsulosin, some would not take any alpha blocker, and some would elect to have their cataract removed prior to starting on chronic tamsulosin treatment. A recent study by Hammond et al1 on outcomes of refractive surgerywas large enough and sufficiently objective to begin comparingthe risk of vision loss from surgery vs contact lenses. Previously,the public and ophthalmologists have assumed that refractivesurgery, while attractive, constitutes the higher risk. Thismay not be correct. This comparison has been slow in coming in part because therisks of refractive surgery vs contact lenses cannot be compareddirectly. Complications from contact lenses accumulate overyears whereas those from surgery occur over a brief time. Ifone assumes that the risk from contact lenses accumulates steadilyand that at least 5% of bacterial keratitis cases will resultin vision loss to a visual acuity of 20/50 or worse, then thetotal risk may be estimated from the yearly rate. Surprisingly,the risk of bacterial keratitis from contact lenses has changedlittle over the years. If the risk does not accumulate steadily,then at least 1 subset may be at greater risk. Cheng et al2 reported the rate of bacterial keratitis to be3.5 cases per 10 000 persons per year for daily-wear contactlenses and 20 cases per 10 000 persons per year for extended-wearcontact lenses. When extrapolated to 30 years, the lifetimerisk of bacterial keratitis becomes 1 case per 100 persons fordaily-wear contact lenses. Cheng and colleagues also noted thatprior to final transplantation, 5% of these patients have experiencedvision loss to a visual acuity of 20/70 or worse. Therefore,the lifetime risk of vision loss to a visual acuity of 20/70is 1 in 2000. Studies by Lam et al3 and Dart4 found essentiallythe same rate of infection. The risk of vision loss from Acanthamoeba keratitis may alsobe calculated using published data. The incidence varies bycountry from an average of 0.3 to 1.5 cases per 10 000persons per year, with the highest rate in Scotland.5 The lownumber yields a 30-year risk of 1 in 1000 or higher. If halfof these patients, a conservative estimate, sustain vision lossfrom the infection, the lifetime risk of vision loss is also1 in 2000. This may seem high, but it is only 1 case per 60 000persons per year. The risk of vision loss from refractive surgery can be calculatedmore directly. Chang et al6 reported an average infection rateof 1 case per 800 persons, with 25% of infected eyes experiencingmoderate vision loss (1 case per 3200 persons). Covering 32 068procedures, Hammond et al1 reported that the incidence of visionloss greater than 1 line, the minimum detectable, was 1 caseper 1250 persons. A loss of 2 or more lines, which would bemore significant but much less frequent, was not specified.Our own data from the Casey Eye Institute, Portland, Ore, on18 000 procedures over 10 years found no eyes with visionloss greater than 2 lines. We propose that the incidence ofvision loss greater than 2 lines may be 1 case per 10 000persons. These calculated risks are obviously approximate and subjectto change. Highly oxygen-permeable contact lenses should lessenthe risks of wearing contact lenses; however, laser surgerywill also become safer. The data sets described earlier cannotbe compared directly, and it is difficult psychologically toequate long- vs short-term risks. Nevertheless, data from large,peer-reviewed studies strongly suggest that our intuition regardingthese risks needs to be reassessed. We look forward to furtherinvestigations of these risks. Available online 1 April 2009. To compare preoperative and postoperative changes in simulated night driving performance after wavefront-guided (wLASIK) and conventional LASIK (cLASIK) for the treatment of moderate myopia. All eyes of subjects with a preoperative manifest spherical equivalent (MSE) between −4.50 and −6.00 who underwent night driving simulator (NDS) testing from 2 clinical trials were entered into the study. This comprised 38 cLASIK patients (62 eyes; mean −5.46 diopters [D] MSE) and 21 wLASIK patients (36 eyes, mean −5.20 D MSE). Patients' records were reviewed from 2 LASIK clinical trials that had similar enrollment criteria. One trial treated patients with conventional LASIK using a bladed microkeratome (cLASIK) and the other treated with a wavefront-guided profile using a femtosecond laser (wLASIK). In both trials, patients with moderate myopia were asked to participate in NDS testing. The detection and identification distances of road hazards were measured with and without a glare source before and 6 months after LASIK. Each eye was tested independently in best-corrected trial frames by a masked operator. In every category, there was a mean reduction in the preoperative to postoperative NDS performance after cLASIK (mean change, −21.3 to −27.9 ft, −6.5 to −8.5 m; 95% confidence interval [CI], −12.0 to −41.3 ft, −3.7 to −12.6 m); there was a corresponding mean improvement after wLASIK (mean change +15.0 to +29.1 ft, +4.6 to +8.9 m; 95% CI, +8.3 to +41.5 ft, +2.5 to +12.6 m). Significant differences between cLASIK and wLASIK NDS performance was observed in every category (P<0. ;01, Tukey's honest significant difference for unequal numbers). A clinical relevant loss of NDS performance (>0.5 seconds) was observed in 32% to 38% of cLASIK eyes for all tasks, whereas only 0% to 3% of eyes had this loss after wLASIK. Between 2% and 7% of cLASIK eyes and 11% and 31% of eyes had a significant postoperative improvement in NDS performance in every task. Wavefront-guided LASIK to correct myopia combined with a femtosecond laser flap significantly improved mean night driving visual performance and was significantly better than conventional LASIK using a mechanical keratome.